Like earlier editions, the third edition of this book is superb and invaluable. It provides a clear, comprehensive treatment about a crucial aspect of every appellate case: the standard of review. The book is above my desk and I've used it on countless occasions. It fills a huge gap in the literature and is one that every appellate law clerk, judge, and lawyer should own. This already essential treatise has become even more so. The third edition takes stock of all the changes and helps the reader understand even the most complicated administrative law doctrines, including the current state of Chevron and its carve-outs and the review of policy statements and interpretive rules. Like the authoritative previous editions, the new third edition lends astonishing practical clarity and logic to an increasingly complicated landscape. All will be extremely well served by the mastery the authors share in this impeccably organized volume. This important book is the indispensable guide to the standards of review that undergird all appellate and administrative law. Reflecting the unique judicial, academic, and practice experience of Harry Edwards and Linda Elliott, this now standard work offers both clear guidance and unifying logic to make sense of the law. It should be required reading for professors, students, and practitioners alike. Many – perhaps most – federal appeals are won or lost on standards of review. Yet too many lawyers pay too little attention to standards of review when developing their appellate strategy. 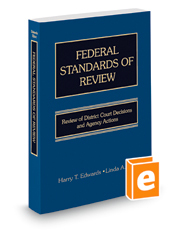 Federal Standards of Review is a crisp, clear, accessible roadmap through even the thorniest aspects of federal appellate review of trial court and agency decisions. – Cate Stetson, Partner, and Co-Director of Appellate Practice Group, Hogan Lovells, Washington, D.C. I thought the second edition would never leave my bookshelf, even as it became seriously dog-eared from use, but I now happily have replaced it with the third edition and already have started putting it to good use as the first step whenever a new judicial or appellate problem lands on my desk. – Carter G. Phillips, Partner and Chairman of the Executive Committee, Sidley Austin LLP, Washington, D.C. This essential volume deserves a place on every appellate lawyer’s bookshelf. It comprehensively answers the first, and often the most important, question in every appellate case. The Third Edition provides up-to-date answers on even the most esoteric questions and deserves consultation, if not citation, in every appeal.